Day two of a multi-day chase trip began in Wichita Falls where I stayed the night before after a successful tornado intercept on the previous day near Sanger. Target for the day was southwest of Wichita Falls, so no one was in a rush to leave the hotel. Skip Talbot, Jennifer Brindley and Phil Bates were caravanning with Sean Casey and the TIV in Doghouse and we discussed the day’s prospects before going our separate ways. A cutoff low was still over California and expected to move a little east during the day while the southern branch of diffluent flow at 250mb was expected to move over the southern areas of the target area. A cold front extended from Iowa through Oklahoma and into the Texas Panhandle and into New Mexico where it was stationary. A dryline intersected the front in New Mexico and was expected to mix eastward into Texas throughout the day. Outflow from the overnight MCS was expected to lift north through the day, possibly stalling out south of the Red River. 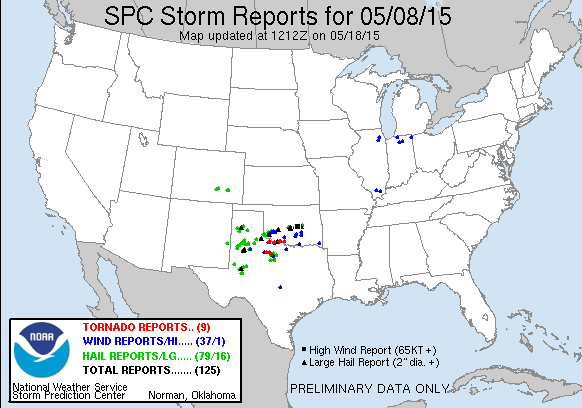 That was the focus for severe weather as the air mass south of it was expected to become strongly unstable. The plan was to sit in Wichita Falls as long as possible because it looked like the action wouldn’t happen too far from home base. 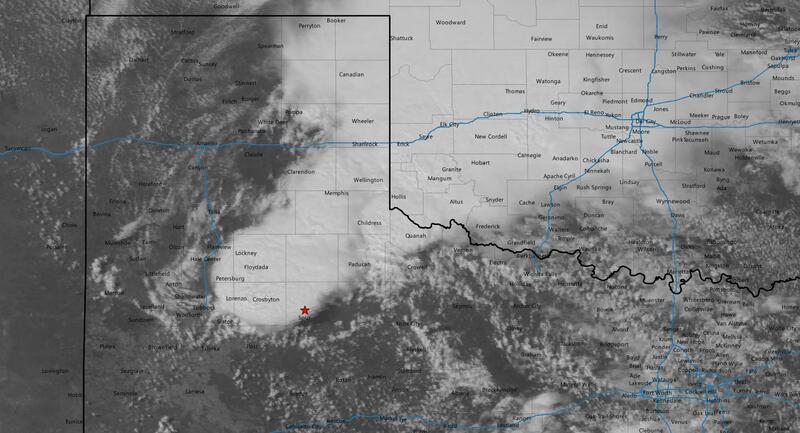 There was already a complex of storms going on in the Panhandle around Lubbock early in the morning which prompted the issuance of a tornado watch from Amarillo to Abilene at 9:30am. 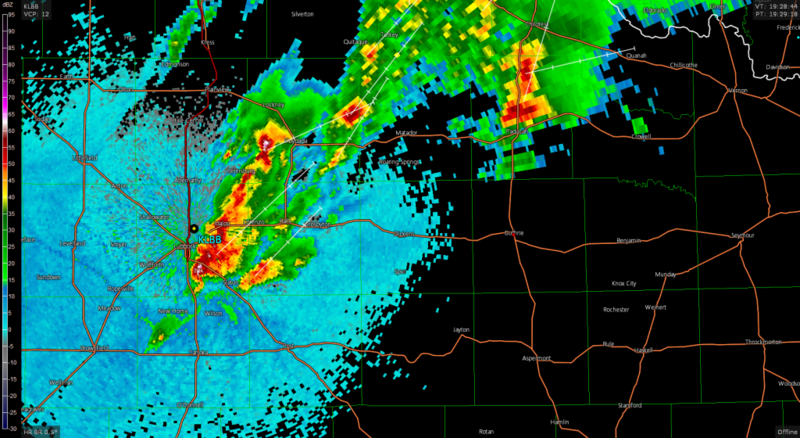 Storms continued to fire in the area as the outflow became a focus point for new development. 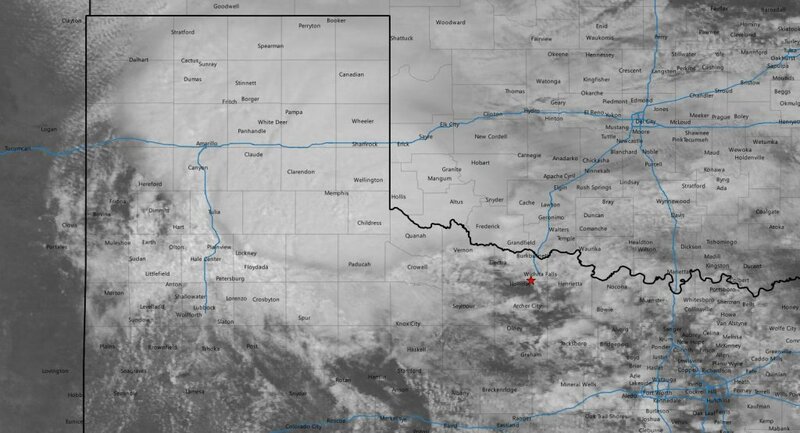 I left Wichita Falls and began to head west as a cumulus field started to develop south of the aforementioned outflow boundary as clearer air was destabilizing south of that. As I drifted west along US 82, the SPC issued a mesoscale discussion for the area along and south of the boundary mentioning an increasing tornadic risk through 22z. Expecting new storm development east of Lubbock, I continued to head west. The cumulus field continued to get agitated and new storms fired south of Lubbock at 19z. As I pulled into Guthrie, the storm just east of the Lubbcok radar rapidly organized and took on a classic supercellular structure. That was the storm to go visit, so I continued westward for a little bit. As the storm passed Ralls, the hook became very extended and distant from the storm. It reminded me a little bit of what the Moore, OK tornadic supercell did on May 20, 2013. 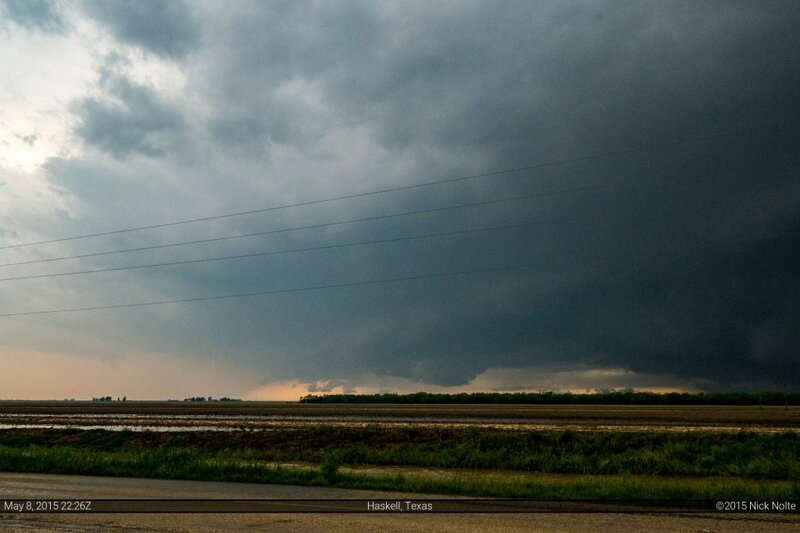 Eventually the RFD surged forward on that cell while the storm back to the northeast went tornado warned. Such a classic chaser dilemma as a storm you abandoned in favor of another goes warned. 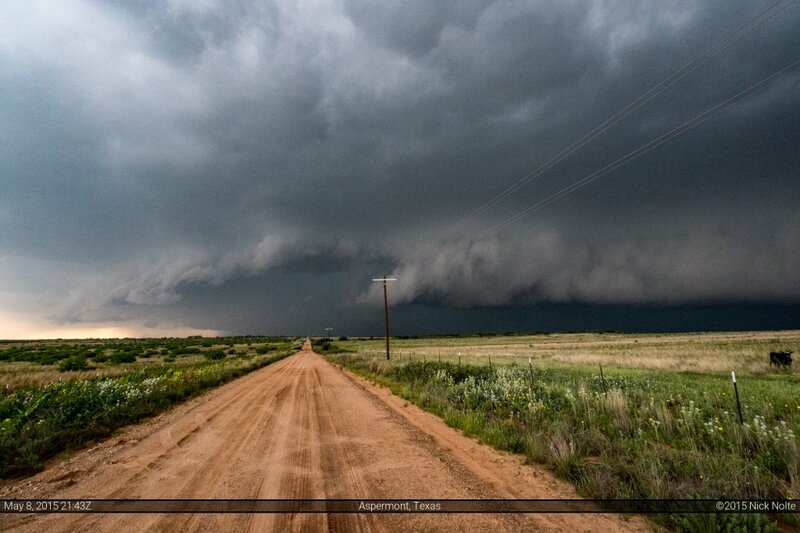 I was west of Spur, TX when I finally got a good visual on the storm and it looked very high precip. With no good south options in the area, I retreated back east to Spur and then back through Guthrie then south towards Aspermont. It was at this time, the hook reoganized and the storm went tornado warned. Of course, while I’m tracking this storm, the one back to the north starts to have tornado reports with it, but that’s 70 miles away so I just ignore it. 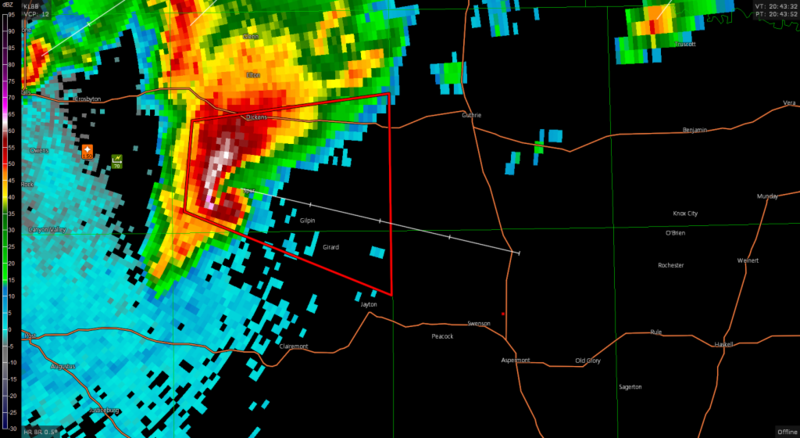 My storm is starting to look pretty lackluster at the moment west of Haskell. As I continue east a tornado report comes in for my storm, but nothing to be seen from my vantage point. I continue east on US 380 towards Throckmorton and take a detour to the north before town to observe and shoot some photos of the gorgeous storm that it had morphed into. I started to head south towards Breckenridge to move in position south of the storm but it grew upscale rather quickly and I called the chase once I got to Breckenridge. I had a long drive to where I wanted to be as I was expecting the following day to be a Western Kansas or Eastern Colorado play, so I drove to Clinton, OK for the night and knew I’d have a long drive in the morning as well.